Syncplicity integrates with Windows Explorer, so you can use the context menu to select a folder for sharing or synchronisation and automatic syncing is quick and transparent. As a safeguard against accidental data loss, any files that are deleted are moved to the Recycle Bin of the appropriate computer so that they can be restored if necessary. When more than one person is editing the same file, two copies of the document are saved to avoid version conflicts – you can choose the one you need later. There are also configuration options to avoid conflicts with shared files. All data transfers are secured with 256-bit encryption, so your data is protected. 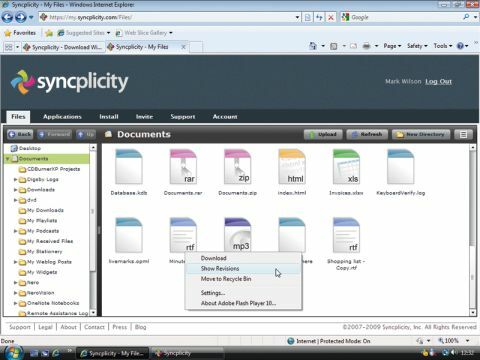 With both PC and Mac versions of the desktop client available, Syncplicity is a great cross-platform tool, although the online file browser's reliance on Flash could be seen as a hindrance. The lack of a mobile client is disappointing, but not a reason to dismiss it.